Vision Matrix and Keyboard, powerful and cost-effective CCTV Matrix solution. Cost-effective solution The 360 Vision Technology Ltd (360 vision) Vision Matrix and Vision keyboard combine to give a powerful and cost-effective CCTV matrix solution with total compatibility to the Vision Dome range. Up to 256 Camera Inputs The Vision Matrix is available with 8, 16, 32, 64, 128, 192 and 256 inputs – each with full telemetry control. Up to 12 monitor outputs The Vision Matrix is available with 2, 4 or 12 monitor outputs. 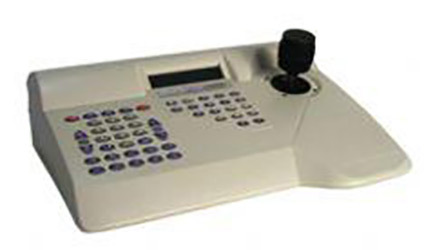 Up to 7 control keyboards Up to 7 Vision Keyboards can control a Vision Matrix with RS232 input for PC control. In coax and “TP” telemetry Telemetry control is selected on each video channel giving a mix of ”in coax” and ”twisted pair/RS485” in the same system. Integration – DVR & transmission The Vision Matrix provides seamless control of 360 Vision Domes by third-party DVR and IP transmission products. Coax only wiring The Vision Matrix enables coax only connection between the Vision Dome and Vision Matrix to be controlled by a 3rd party RS485 transmission system. Multi-site control Simultaneous control of local and remote sites make the Vision Matrix ideal for central monitoring applications. Comprehensive alarm handling Up to 144 alarms, each capable of instigating multiple camera actions can be programmed via the on-screen menu. 360 VisionDome compatibility All Vision Dome and VisioniDome features can be accessed from the Vision Matrix to enable first line, remote maintenance. On-screen menu A simple on-screen menu system enables easy and intuitive system set up. Variable speed PTZ Dome speeds of between 0.1°/s to 400°/s (pan) are controlled with the vision keyboard’s 3 axis joystick – speeds adjust in proportion to zoom position. Shop monitor Vision Domes used for surveillance purposes can be prevented from appearing on shop monitors. Each camera can be set as ”public” or ”private”.